When then-Winder-Barrow coach Heath Webb was approached about the vacant Gainesville job, two things jumped out at him -- and both had to do with the projected roster. But Webb also knew the history of the program, and that, as well as the challenge of rebuilding one of the state’s most consistent winners, was too much to pass up. The Red Elephants were coming off back-to-back losing seasons for the first time since 1999-2000 but still had made the playoffs both seasons. But along with youth and potential also come the other side of the equation: inexperience and growing pains. And man did the Red Elephants exhibit and suffer through both, especially over the first seven weeks of the season. Gainesville dropped its opener 42-0 to Mary Persons (“the most complete team in Georgia I think I’ve seen in several years,” Webb said) in a game that was called at halftime due to weather. They dropped a pair of last-minute games to North Forsyth (24-21) and Lambert (16-15) and were roughed up by Jefferson (42-10) and Flowery Branch (28-19) for the program’s first-ever 0-5 start to a season. 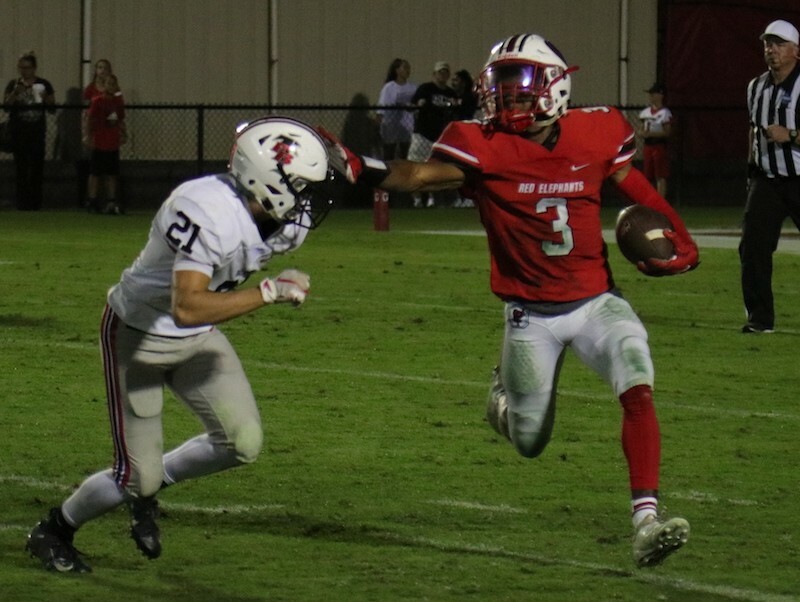 The losing streak stretched to seven with a blowout loss to Dacula (37-7) to open Region 8-6A play and then a shootout loss to Habersham Central (49-32) to put the Red Elephants immediately behind the eight-ball if they had any thoughts of the playoffs. “We expected some growing pains for sure,” Webb stated. “The non-region was so tough we knew if we could get one win, maybe two, that would go a long way. It wasn’t real fun, that’s for sure. The Red Elephants switched defensive alignments going to more four-man fronts and moving some pieces around in the linebacking group and secondary. Sophomore Gionni Williams, who had to sit out the first half of the season, also had taken over at quarterback and with the move of 6-foot-5 junior Walt Dixon from quarterback to receiver, to go with senior running back Quitavious Hayes, suddenly the offense started taking on an identity. But it was during a back-and-forth affair with Webb’s old team Winder-Barrow that Webb saw the final spark, or in this case the lack of, that he was looking for. It was 0-0 in the fourth quarter with the Red Elephants facing a crucial 3rd-and-12. Williams completed a pass for 13 yards and then as the play went out of bounds into the Gainesville bench, a potential brawl began brew after some pushing-and-shoving. But instead of escalating the situation, Webb said his group maintained its composure, which resulted in three personal foul penalties on the Bulldoggs, setting up the go-ahead touchdown, which propelled them to a 20-7 victory -- their first of the season. They followed that up with a nail-biting, defensive slugfest 7-6 win over Apalachee on the road the following week. They were still alive for a playoff berth but a loss to Lanier in the season finale and a Apalachee win over Habersham Central would have left the Red Elephants out of the playoffs for the first time since 1999. Gainesville even had a chance to grab the No. 2 seed and a home playoff game with a win over Lanier. However, they dropped another nail-biter, 6-2, to the Longhorns but Habersham beat Apalachee to keep the Red Elephants playoff streak of 19 straight seasons and counting alive. Gainesville (2-8) will be the No. 4 seed from Region 8-6A and will travel to Region 5-6A champion Creekside (7-3) on Friday to open the 2018 playoffs. The Gainesville defense has been as stout as any coming down the stretch. After yielding 34 points per game during the seven-game losing streak, they have gave up just 19 total points over their last three games (6.3 ppg). The offense is still a work-in-progress (133 points, 13.3 ppg), but Webb said don’t let the records and the roller-coaster season fool you. The only real health issue for the Red Elephants heading into Friday night’s showdown in Fairburn is Hayes, who is questionable after not playing in the second half last week. But no matter what happens on Friday, Webb said he is already looking to fast-forward to August 2019. “Just seeing the progress over the last four weeks has been exhilarating and a lot of fun and really what makes coaching fun: seeing the potential in people begin to come out and show itself,” he said. “I’m ready to get going on next year and jump ahead nine months. “Again, this whole season was going to be a work-in-progress no matter how it turned out because of just how young and inexperienced these guys were on how to play at this level. It was a process of learning how to practice, how to watch film, how to conduct yourself in the weight room, just so many things. “They could have completely crashed during the losing streak but instead they continued to work hard. As a coach you always want to think it was something you did as an individual or as a staff that made the biggest difference. Gainesville's Keshaun White (3) stiff-arms a Flowery Branch defender in a game played earlier this season.